Poverty ranges from 38% to 63% of the population on many reservations. Serving immediate needs. Supporting long-term solutions. Strong, self-sufficient Native American communities. 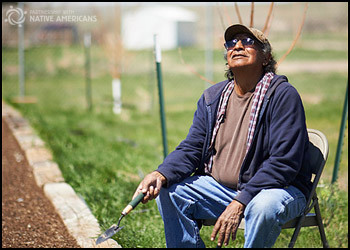 Partnership With Native Americans is a 501 (c)(3) nonprofit organization committed to championing hope for a brighter future for Native Americans living on remote, isolated and impoverished reservations. Collaborating for more than 25 years with our reservation partners, we provide consistent aid and services for Native Americans with the highest need in the U.S.
Much of our work centers around material aid, educational support and community-based services. PWNA also connects outside resources directly to reservations through its distribution network and reservation partnerships. We care about quality of life for Native Americans and respect their self-determined goals for their tribes. The only Native-serving charity to work on 60 reservations year-round, our service area is concentrated in 12 states and encompasses Pine Ridge, Rosebud, Navajo and other high-need reservations. PWNA has a strong network of more than 1,000 partnerships with reservation programs (our Program Partners). We work through these partners to bring much-needed relief to 250,000 Native Americans each year. PWNA partnerships reach into remote reservation communities that most Americans never see and most organizations cannot reach — whether due to geography, a need for reservation contacts or cultural competency, or a lack of information about specific needs. We operate a highly efficient warehouse and distribution system that lets us truck over 5 million pounds of materials to our reservation partners each year. PWNA’s reservation partners ensure goods make their way directly into the hands of the people who need them. PWNA’s approach brings several other important benefits to those who work with us. The fact that our Program Partners are Native Americans who live and work on the reservations gives us added insights on how to work effectively on the reservations. Their success stories reflect their dedication. Through our partnerships over the years, we evolved "The PWNA Way" and our guiding principles of stewardship, volunteerism, and respect. To make a difference in such a wide service area, PWNA relies on the generosity of concerned Americans as well as corporations and foundations that are able to make grants or donate goods in bulk. We deliver the donated and purchased goods to our reservation Program Partners, who distribute the goods in their communities. Typically, product donations take the form of basic necessities, which are much needed in our remote communities. PWNA covers any cost of shipping the goods from wherever they are to our distribution center in South Dakota or Arizona. Monetary donations help us purchase similar goods at volume discounts and transport the goods to the reservations. Both monetary and product donations increase the quality and quantity of goods that PWNA provides and support a greater impact on quality of life for the Native Americans we serve. PWNA subscribes to the Red Crescent Code, an international code of conduct for nongovernmental organizations (NGOs) in disaster relief. The Red Crescent Code sets forth standards for governmental independence, effectiveness, and impact in delivering NGO services. Developed by the American Red Cross and other entities, the Red Crescent Code closely aligns with the PWNA Way. Our approach to working on the reservations has been a key factor in sustaining more than 1,000 reservation partnerships.